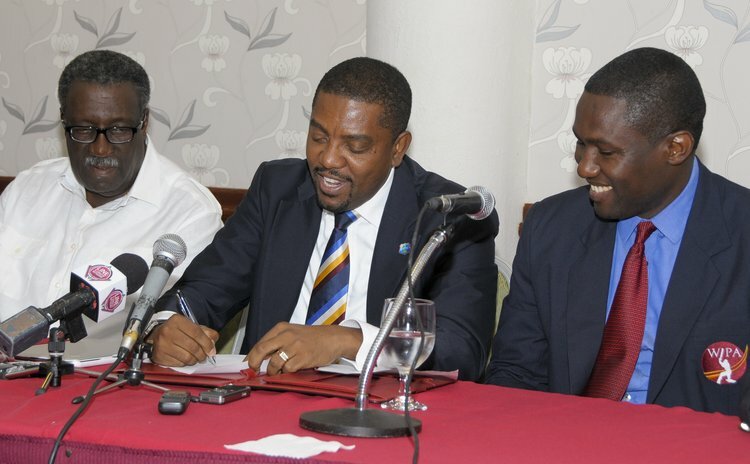 BRIDGETOWN, Barbados –The West Indies Cricket Board (WICB) and the West Indies Players Association (WIPA) signed a new Collective Bargaining Agreement (CBA) and Memorandum of Understanding (MOU) during a ceremony on Thursday. Whycliffe 'Dave' Cameron, President of the WICB, signed on behalf of the regional board, while Wavell Hinds, President of WIPA, signed on behalf of the players association. Cameron hailed the signing as a "new partnership which will take regional cricket forward" while Hinds said it "created a stable environment" for the players to play and demonstrate their skills. The signing ceremony was also attended by Clive Lloyd, former West Indies captain and Chairman of Selectors; Michael Muirhead, Chief Executive Officer of the WICB, and Richard Pybus, Director of Cricket of the WICB. "The one word to stress is partnership. Right through the theme is partnership. Everything we have done we have done in partnership. The agreement is we do better as an organisation and the players do better," Cameron said. "This is the most important things we have done for West Indies cricket in the last couple of year. What it means is that we are going to have 105 players engaged in cricket all year round. We are going to have 15 at the WICB level – which I will call the international team, while we will have 90 players at the regional franchise level – 15 players among the six teams." Hinds, a former West Indies batsman noted: "This means stability and means we are operating in an environment which speaks to partnership and putting West Indies Cricket first. It will make sure that the pillars are in place to look after the players and the key stakeholders of West Indies Cricket – who are the fans." Pybus outlined details of the new franchise system. "This is going to be fantastic for the players. We will have structured support mechanisms for the players and will provide a competitive wage in a competitive marketplace which is going to fantastic in terms of the product we put on the field," he said.